Try rent to own stores when shopping used furniture. When talking about buying used furniture, appliances or electronics, the first places Americans think is garage sales, newspaper ads or craigslist. What most people don’t realize is that rent to own stores can be a treasure trove regarding good used furniture at great prices. Statistics show that new rent to own home furnishings are returned within the first four months. And the return almost always has nothing to do with the quality of the furniture but personal circumstances. 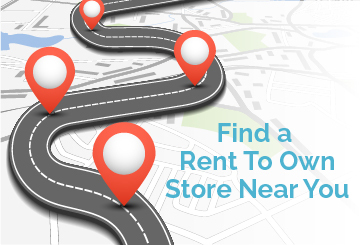 Add to the fact that most customers want new merchandise so there is an incentive for rent to own stores to get rid of used merchandise quickly. They still make a profit, get rid of used inventory and you get a great deal on furniture that has just a little wear and tear. So if you’re going the RTO option, follow these tips. Find out the local rent to own stores in your area then call each to express what you’re looking for. Each rent to own store has different policies regarding selling used furniture and obviously what is available. Because each have different policies, try to talk to a manager or the owner. It is in their best interest to get rid of inventory and they’ll have the most flexibility to cut a deal. Find the stores that are eager to work with you and try them first. You want those rent to own stores that have the mentality and business model of wanting used merchandise out of the showroom floor so will have you on their mind. That’s why you work with the manager or owner as it is in their best interest. If you don’t need the furniture immediately then use patience and shop around or wait. Research prices of similar furniture to know what you can offer regarding what they can offer. And research through craigslist, newspaper ads and garage sales. Heck, those may offer you a better deal anyway. Always shop around, the consumer is in full control in these retail times. Never buy before you try. Always visit the store and sit on the furniture before and inspect it closely. Rent to own stores are good because they spend a lot of time refurbishing the product. Rent to own used furniture. If you’re not sure about the furniture, then rent it for a couple of months to try. If you like it then exercise the early purchase option. The beauty of renting to own used furniture, you’ll get smaller payments or smaller time periods or both. And if you’re renting to own it, the product is under their warranty during the rental period. If you’re buying it outright, make sure they deliver it for free. That shouldn’t be a problem as they’re in the business of customer service. You have four choices when acquiring home furnishings for your abode. Keep them all in mind to make sure you get the best home that your money can buy. Just another ShopRTO Home Decorating and shopping lifestyle tip. ShopRTO provides consumers home living and decorating tips and promotes rent to own as a shopping option for affordable home furnishings.